A You have to go back to October 28th 2000 for the last Fife foursome. Dunfermline beat Dundee 1-0 at East End Park in the SPL. In the First Division, Raith Rovers won 2-1 away to Inverness Caley Thistle. And in the Third, East Fife had a 3-1 triumph over Montrose at home while Cowdenbeath took the points with a 3-2 victory at Elgin. There was a 100% Fife success rate on February 23rd this year when Raith hammered Falkirk 5-1 at Starks Park, East Fife edged East Stirling 1-0 at home and Cowdenbeath won 2-0 at Hamilton. There were no SPL fixtures as it was Scottish Cup quarter-final day so Dunfermline, having lost at Ayr in the previous round, didnt have a match. Q From Tom McInally: Who were the Celtic goalscorers in the 1958 league cup final against Rangers? Was the McNeill scorer, Billy the later Celtic captain? A Billy McPhail, not McNeill, scored a hat-trick in the famous 7-1 victory in the League Cup Final on October 19th 1957 in front of a crowd at 82,293 at Hampden. 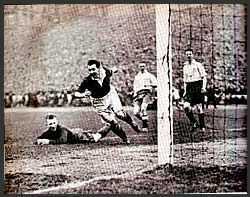 Neilly Mochan grabbed two and Sammy Wilson and Willie Fernie with a spot-kick were the other scorers. 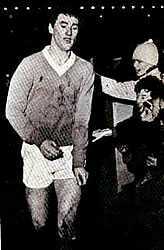 Billy McNeill signed for Celtic in August 1957 but didn't make his first-team debut until the following season. A Just one. Brazil played thirteen times for Scotland (eleven while with Ipswich, two with Spurs) and it was in his twelfth appearance that he struck the second in a 2-0 win over Wales at Ninian Park in 1983. Other than Ipswich and Tottenham, he also played for Man Utd, Coventry and QPR before a back injury forced him into premature retirement at the age of just 27. He made his Scotland debut shortly before his 21st birthday when he replaced Joe Jordan at half-time in Poland in 1980 and his final appearance was against England just four days after his goal against Wales. Scotland were beaten 2-0. Brazil was still only 23 at the time of his final cap. His international outings gave rise to one of the best trick questions in football: Which country holds the record for the longest pass in a match? The answer being Scotland when the ball travelled all the way from Jordan to Brazil!